Ouch, this one is tough. We have before us a small green and yellow bird with its head turned away and partially hidden by a branch, and body feathers covering the wings. Photo quizzes don't come much more challenging than this. Can this bird even be identified to species? The best way to approach any photo quiz is to narrow down the possibilities to reach an answer, so let's start narrowing. Based on color and shape we can safely say that our quiz bird is a passerine of some kind. There, we've significantly narrowed down the possibilities right away and without even trying very hard. The unstreaked green and yellow plumage pretty much eliminates all passerines except for flycatchers, vireos, tanagers, orioles, female and immature Painted Bunting, and warblers, so those are the groups we should work with. The shape of this bird doesn't look right for a flycatcher, and I'm hard pressed to think of any flycatcher that is green above with extensively yellow underparts, except for Yellow-bellied, and the upperparts of a Yellow-bellied aren't as bright as the upperparts of our quiz bird. Moving on, and using color again, none of our vireos are bright green above and extensively yellow below. Yes, some Philadelphia Vireos can be extensively yellow on the underparts but they wouldn't be as bright green on the upperparts as our quiz bird. Female and immature Scarlet Tanagers are yellow below and greenish above but the shape of this bird doesn't look right for a tanager; tanagers are chunky critters. The only oriole that roughly matches the color of our quiz bird is Orchard Oriole in female and immature plumages, and I don't think the tail of our bird is long enough for an oriole. Also, the upperparts are too green for an Orchard Oriole. How about a female or immature Painted Bunting? Female and immature Painted Buntings have broad greenish edges to the tertials, and the tertial edges of our candidate look grayish, not green. On to warblers. 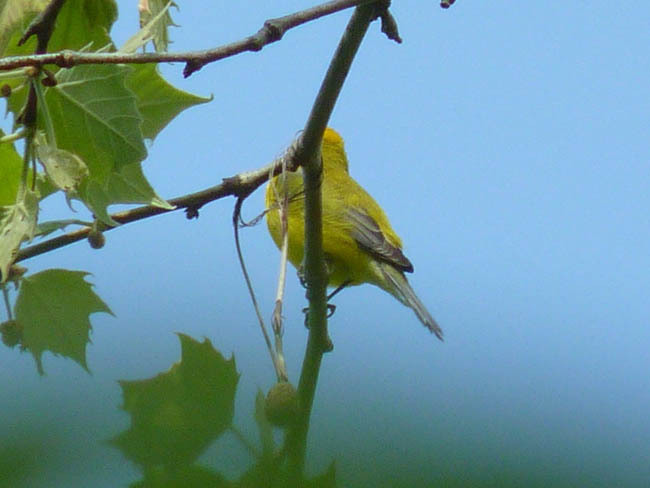 A number of warblers are green above and yellow below and lack streaking, including Prothonotary, some plumages of Yellow Warbler, the Oporornis, 2 Wilsonia, Common Yellowthroat, Yellow-breasted Chat, and several of the Vermivora. The underparts of our bird are too extensively yellow for a Prothonotary Warbler, Prothonotary Warblers having gleaming white undertail coverts that contrast with the yellow underparts. All ages and plumages of Yellow Warbler have yellow edges to the tertials, and, as mentioned before, our candidate has grayish edges to the tertials. All of the Oporornis are green above but the green is a darker green, more like olive. How about Wilson's and Hooded Warblers? If you look closely you can see that there is a little bit of white on the undertail coverts of our quiz bird; Hooded and Wilson's Warbler's have completely yellow undertail coverts. A Common Yellowthroat would have completely yellow undertail coverts and dingy olive sides. The bird is the wrong shape for a Yellow-breasted Chat. That leaves the genus Vermivora to consider, and among the Vermivora only one species has extensively bright yellow underparts, bright green upperparts, and white on the undertail coverts, and that one is Blue-winged Warbler. This Blue-winged Warbler was photographed By Matt Winks on April 18, 2010 at Pomona in Jackson County, Illinois.